Lucky Dragons is a communal music experiment from Los Angeles based artists Fischbeck and Rara. 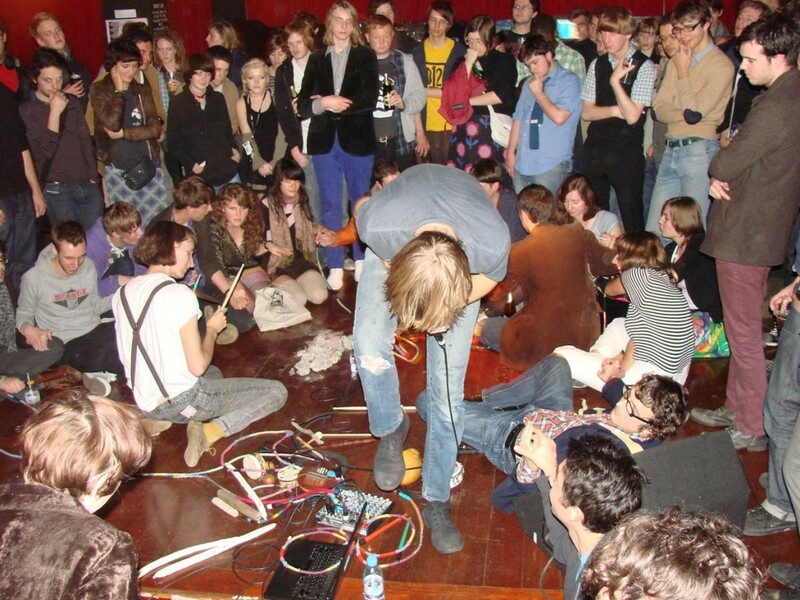 Live performances involve participation between audience and band and aim to generate equal power-sharing situations. Created in the spirit of celebration Lucky Dragons is a communal music experiment relying on show goers to to compliment each other by linking themselves and the audience through sound to video, dance, and interactive technology. Lucky Dragons will perform their ongoing project ‘Making a Baby’, a piece which involves sound production by creating human circuits through touch. Using cyber-psychedelic imagery and circuit jammed synths, Lucky Dragons challenge hierarchy and rhetoric and focus on communal music production and contact. Field recordings, feedback loops, and found sounds are mixed with thematic references to folk tradition and protest songs placing the emphasis on the experience of live music and togetherness. Lucky Dragons injects humanity into typically ‘cold’ technologies and uses these to inspire friendship, solidarity and discovery. Throughout the day Auto Italia will host Fishbeck and Rara’s ongoing drawing collective called Sumi Ink club. Since its instigation in 2005 the project has a mandate of being non-hierarchical and allowing “all ages, all humans, all styles”. In these sessions communal drawings are made in ink on paper and the windows of the space as a way of documenting and creating social interactions that extend into everyday life. All invited, all welcome, ink brushes and paper provided. Part of a wider practice of re-contextualising psychedelic imagery, folk art and hippy practice in California, Lucky Dragons and the Sumi Ink Club are examples of communal art production which favours non-hierarchical systems of organisation and the importance of art events to provide a meeting point for physical contact and exchange. The events lay somewhere between straight forward gig, live art and performance and touch on interactive technology and the skill-sharing workshop. They reiterate values that are key to Auto Italia and through their practice build social collectives that can interact with each other and make a sincere attempt to reintroduce contextual and human meaning into art through its production and development. Lucky Dragons have performed and exhibited internationally including: The Whitney Museum of American Art, The Kitchen and PS1 in New York, ICA London and the Centre Georges Pompidou in Paris. The Sumi Ink Club and Lucky Dragons are part of an ongoing partnership between Auto Italia and Upset the Rhythm.